"They tell me I'm cold and calculating. They tell me I'm not a team player. I say this without pride or pleasure. It is a simple fact. I am the best Warrior in the Immortal Societies. "When a team of scientists unearth scriptures older than the Dead Sea Scrolls in a cave in Egypt, a mystery lost to the tides of time is uncovered. Heading the expedition is Dimitri Reznak, the Head of the Crovir Immortal Culture & History Section. But the monumental discovery is spoiled by evidence of looting and half the priceless artifacts Reznak has sought for centuries have disappeared.Alexa King is a covert agent for the Crovir First Council. Cold, deadly, unrivaled on the battlefield, she is the perfect warrior. When her godfather Dimitri approaches her for a mission that could elucidate the enigma of her lost past, Alexa is drawn into the dangerous and shadowy world of secret religious societies along with Zachary Jackson, a gifted human and Harvard archaeology professor assigned to help her. In their hunt for the missing artifacts, Alexa and Zachary cross path with a sinister sect whose origins are as mystifying as the relics they are searching for, and unveil a centuries-old plan that aims to shatter the very structure of civilized society.From North Africa to the doors of Vatican City and beyond, Alexa and Zachary must outwit the enemy and uncover the astonishing truth behind the missing artifacts and Alexa's own unearthly origins before all is lost. 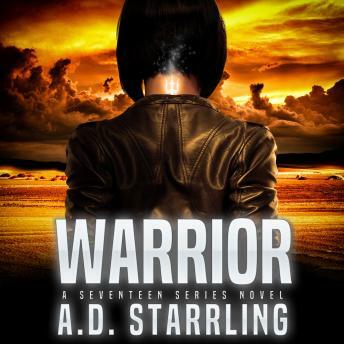 Warrior is the exciting, action-packed follow-up to Hunted and the second installment in AD Starrling's bestselling supernatural thriller series Seventeen. If you like high-octane, fast-paced adventures that combine science and fantasy, then you'll love the world of Seventeen. Get this pulse-pounding thriller to continue the epic series today!